How to create a solid and reliable fixing to a lath and plaster and surface. When the wall is not finished with plasterboard then you will almost certainly have to fix to a lath and plaster wall. Understand how they were created so you then know how to achieve a secure fixing that is not going to cause damage. We show you how to remove a section of the lath and plaster and insert a solid surface so that any fixings are then secured to this solid surface. There are many fixings on the market today and yet, as far as we are aware, no fixing is available for a good, solid, reliable fix to lathe and plaster. It’s a popular question on DIYdoctor and our many years of experience have taught us not to take chances with wall plugs, toggles and plasterboard fixings. Please see our project on fixing to plasterboard for more information. Below is a section of a lath and plaster wall face on. You can see the pink plaster, which is pushed onto and into the yellow laths, which in turn are fixed at narrow spacing to the upright timber studs. A section of the wall in the image above where you can see how the plaster is pushed into the laths. 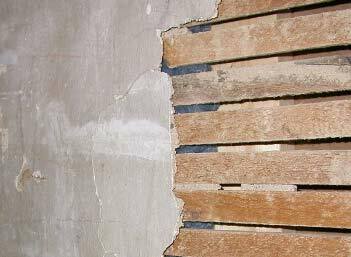 Lath and plaster was used as a wall finish long before plasterboard took over from the centuries old Wattle and Daub finish. Wattle was the name for twigs and branches that were interwoven between the upright timber posts that formed the framework of a dwelling. Daub was the name given to the various forms of mud, clay, lime, manure or other locally available, easily workable fillers that could be pushed smoothed onto the wattle. The daub was pushed, usually by hand, into the web of branches forming a weatherproof surface. Lath and plaster is an extension of that idea and was used long after the invention of plasterboard by Augustino Sackett in approximately 1888. Plasterboard took a while to catch on and was introduced to the UK in 1917. It became widely used and started to replace Lath and Plaster by the 1930’s. The plaster is pushed onto and into the timber laths, which have been nailed to upright studs. Gaps are left between the laths to allow the plaster to be pushed in. When it sets it clings to the laths making a fairly strong surface. However, most lath and plaster walls and ceilings in this country are at least 40 years old and often past their “sell by” date.The laths are very flexible allowing the wall to move, the plaster by now, often crumbling behind and in between the laths. The only solid fixing therefore is to replace some of the lath and plaster with a solid surface to fix to. This involves making a hole in the wall between two studs. 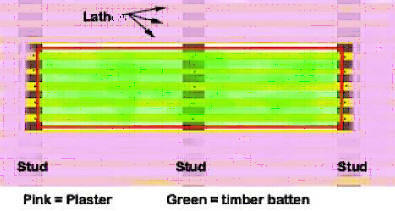 The diagram above shows the timber batten across 3 studs, but between two is fine. Using a hobby knife or sharp chisel, cut out your hole and cut the laths back onto the timber studs. The plaster and laths are usually about 1 inch thick and a batten size of 2 inches by 1 inch PAR or PSE (These are timber merchants abbreviations for Planed All Round and Planed, Square Edge which both mean the timber has been planed to a finish and is not in the rough “Sawn” state) is sufficient for fixing most things. You can increase the width of the timber by as much as you like to fix items like coat hooks and microwave brackets which you would not ordinarily be able to fix to a lath and plaster wall. Cut the hole as closely as you can to the size of the batten but it is very likely you will have gaps between the batten and the plaster surrounding it. Before you fix the batten it is a good idea to paint the edges with an undiluted solution of PVA adhesive and bang a few 20mm galvanised staples in along the edges. When the batten is fixed you can then fill around the perimeter with either plaster, polyfiller or flexible filler from a tube. The choice of filler will depend on the size of gap, but the PVA will allow it to stick to the edges of the batten and the staples will give it reinforcement. Hopefully, whatever it is you need to fix to the wall will cover the batten (which of course you can paint to match the wall) but if not, and given that its unlikely your painting match will be “seamless”, sometimes it’s a good idea, instead of trying to disguise the batten, to make a feature out of it by painting it an entirely different colour and even putting some beading round it. For those who are experienced in DIY it is possible to use a slightly thinner batten, or notch the batten into the studs a little, and cover the batten with plasterboard which can then be plastered right up to the edges of the existing plaster. This makes the fixing batten invisible. For simple repairs in lath and plaster walls see our repairing lath and plaster project.